"Everything's ok. He's resting now, having a sleep. Everyone's health is fine, there's nothing that can't be put right. I'll be discharged soon. Everything is ok."
Is this the final nail in the coffin of the British government's Skripals poisoning hoax? Russian TV on April 5th released audio purportedly of a phone call between Yulia Skripal and her niece Viktoria who lives in Russia. During the call, which was made in the morning on April 5th, Yulia tells her niece: "Everything is ok. He [her father] is resting now, having a sleep. Everyone's health is fine, there's nothing that can't be put right. I will be discharged soon. Everything is ok."
Yulia Skripal and her father Sergei Skripal were supposedly poisoned by a deadly nerve agent dubbed "novichok." Boris Johnson claimed Porton Down told him it was "absolutely categorical" the nerve agent was made in Russia. Porton Down came out yesterday and said contrary to Johnson's claims, they could not confirm the nerve agent was made in Russia. Despite allegedly being poisoned with an extremely deadly "military grade" nerve agent, the Skripals shopped for hours before falling ill and Yulia Skripal miraculously went from being in "critical condition" to "rapidly" recovering last week. 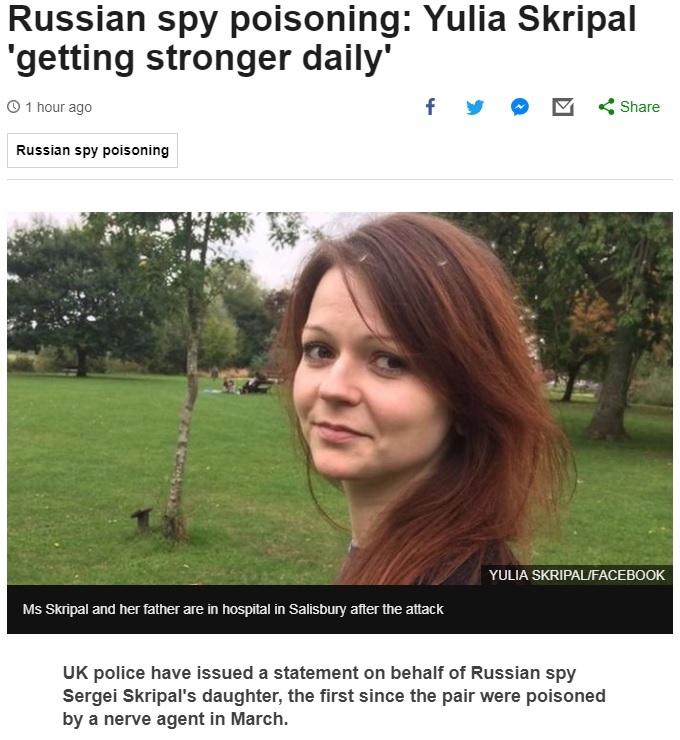 The propagandists at the BBC covered the phone call this afternoon under the innocuous headline, "Russian spy poisoning: Yulia Skripal 'getting stronger daily.'" After saying her "strength is growing daily," they drop this line: "Mr Skripal, 66, remains critically ill but stable." Eventually, they get to the meat of the issue. 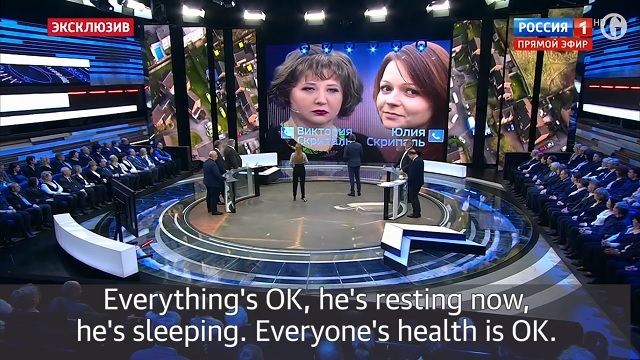 Correspondents say that what Yulia says in the recording about her father "resting" does not chime with what we know of the Skripals' health, and the conversation about the visa is strange. The Foreign Office said its Moscow embassy was expected to give Viktoria a visa, possibly on Thursday, and that she would be given full consular help in the UK. Russian news agency Interfax also quoted the cousin as saying in an interview that they had spoken and that Yulia had told her that all was well. Viktoria expressed surprise that the phone call had come a day after she had told media that she was not allowed to speak to Yulia, Interfax reported. "Do you believe in coincidences? I don't," it quoted her as saying. Viktoria is said to be one of the pair's closest living relatives after a series of family deaths. "Yulia": Hello. Can you hear me? "Yulia": It is Yulia Skripal. Viktoria: Oh, Yulka [diminutive of Yulia] it's you! I can tell it's you from your voice but I don't understand. So, they gave you a telephone, did they? Viktoria: Thanks God! Yulyasha [diminutive of Yulia], is everything okay? "Yulia": Everything's ok, everything's fine. Viktoria: Look, if tomorrow I get a [British] visa, I'll come to you on Monday. "Yulia": Vika, no-one will give you a visa. Viktoria: If they do, I need you to tell me whether I can visit you or not, tell me that I can. "Yulia": I don't think so, that's the situation at the moment, we'll sort it out later. Viktoria: I know, I know. "Yulia": Later, we'll get it sorted later, everything's fine, we'll see later. Viktoria: Is that your phone? "Yulia": It's a temporary phone. Everything's fine, but we'll see how it goes, we'll decide later. You know what the situation is here. Everything is fine, everything is solvable, everyone is recovering and is alive. "Yulia": Everything's ok. He's resting now, having a sleep. Everyone's health is fine, there's nothing that can't be put right. I'll be discharged soon. Everything is ok. This hoax is collapsing faster than Hillary Clinton on a flight of stairs. The UK government needs to issue Russia an apology and the EU and the US need to reverse their expulsion of Russia's diplomats and end the war footing they moved onto based off this complete and total sham. We've had enough of the whole "wars based on lies" shtick.